I remember this movie being pretty controversial when it came out, but as someone with a busted, isolated childhood, I've always thought of it as the most honest depiction of that that I've ever seen. The Baroque interiority you develop in response to your emotional environment and its moments of incidental beauty; the awful cosmic dimensions that environment takes on at the edges of your awareness in the face of the fact that you have no concept of escaping it; and the slim hope, once it's all over, of ever being able to function fluently in the wider world given how deeply specialized your coping mechanisms are (and, left as implication, the tendency towards reproducing that environment in a maybe subconscious drive to feel competent again): I've never seen it put so viscerally. I think the movie's unwillingness to judge Jeliza-Rose's circumstances is what put people off, but it seems like a necessary part of inhabiting her psychological sphere: she doesn't have the perspective or the experience (or maybe just the wrong experience) to step back and evaluate things the way that we do. It mostly trusts that we're all on the same page about what is and isn't wrong from that wider perspective and so avoids reasserting those truths contrary to the grain of her internal experience. That tends to make people uncomfortable, I guess. I think this is a fantastic, intense film. I'm grateful that I've seen it, and equally as grateful that I never have to watch it again. It is, at times, quite literally a horror movie, in that the emotion it evokes most effectively is horror. It may be one of Gilliam's best things - certainly of the ongoing curate's egg that is his latter career. But, boy, does it need a gentle warning in advance. I showed this film to my wife last year. I think it's brilliant on rewatch for how Gilliam presents information throughout the film. It's horror being shown masterfully well through a little girl's perspective (and narrated by her dollheads a lot of the time.) But at no point do you lose track of what's going on scene to scene. I watched this too long ago to have a ton to say about it but I remember that I loved it enough to wishlist the DVD, and felt it had a similar feel to Northfork. Mirrormask is a more distant cousin from the same era. One of my favorite Gilliam films, but one I probably won't watch again for a long time. invitapriore - I think the movie's unwillingness to judge Jeliza-Rose's circumstances is what put people off, but it seems like a necessary part of inhabiting her psychological sphere: she doesn't have the perspective or the experience (or maybe just the wrong experience) to step back and evaluate things the way that we do. I remember Gilliam going on about how he felt like he really inhabited the character, to the point that it got weird with the people he was working with. Because, yeah, how crazy is it for a rambly, brilliant old man to go method-deep on a little girl character in horrific circumstances? These aspects of the film are what have stuck with me in the years since I watched it. Such fantastic perspective and storytelling that conveys something so bogglingly horrible in such a sensible and relatable way, it hurts. I remember it took me a long time to decide if I liked this movie. I trusted Gilliam enough to stick with it through the end, and I'm glad I did, but I was really iffy about it. Years later, I think it is one of his best movies. I found this difficult to watch. It's Terry Gilliam, whom I admire and love because of my childhood memories of Time Bandits and Brazil and Munchausen and others, but I also realize seems to have spent a lot of that creativity and for the past few decades, his movies have been solid "misses" for me. 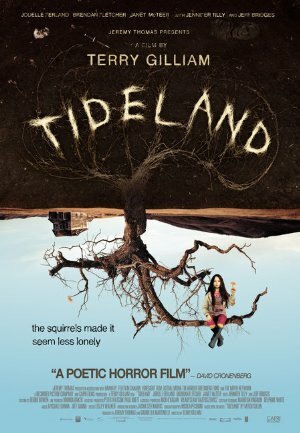 Tideland, though? Yeah, a solid miss. The creepiness and genuine squirm-inducing parts with the pre-pubescent character/actress and the (mentally retarded) adult male character/actor approaching areas and doing things that they simply shouldn't be....yeah. Or is that what the movie is talking about? Is that what it was trying to say, that This Is Inappropriate and You Should Be Uncomfortable Here? But most of all, it requires the viewer to be with this girl for most of the movie, a girl that is weird and arguably insane, only talking to her doll (or something) with dialogue that amounts to essentially nothing. Jeff Bridges dies in the first ten minutes and after that it's the girl and her dolly and that's not enough to carry a movie. It's been quite a while and now that I'm older and wiser (?) I might have a different response in watching it again. Who knows.